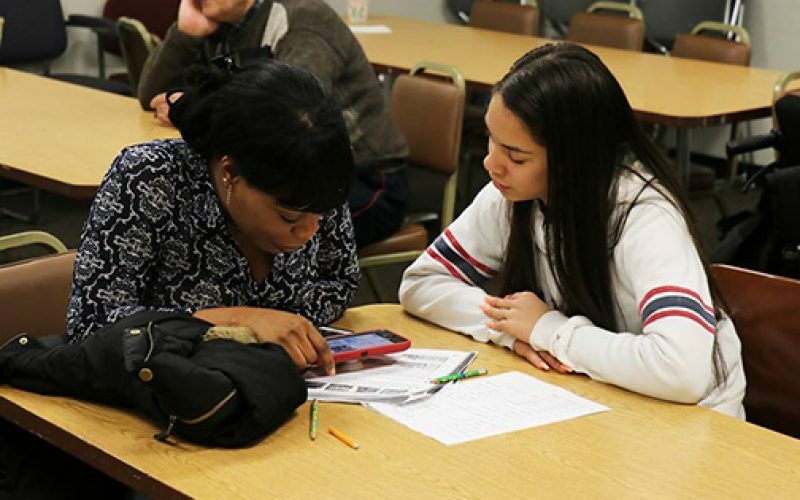 A bilingual Gloucester Catholic High School student tutors an asylee from Haiti who is learning English during one of the school’s visits to Catholic Charities, where the students eagerly engaged in volunteer work and service projects. Gloucester Catholic High School students assemble donated bicycles at the offices of Catholic Charities, Diocese of Camden. In recent years, there has been a growing trend that schools, both public and private, offer students opportunities to engage in community service. For many, the experience helps to develop important skills such as teamwork and a sense of compassion. 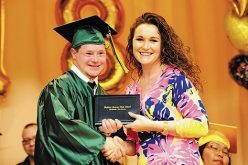 But for Catholic schools, community service is more than an admirable option or a nice addition to one’s college application. 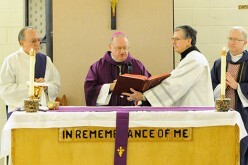 Service activities are fundamental to Catholic education and core to Catholic discipleship. And so when students at Gloucester Catholic High School began their studies about the responsibilities and duties to society as members of the church, a trip to Catholic Charities was a good place to start. 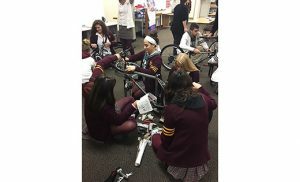 Led by Catholic Charities staff, a group of 17 students were put to work assembling bicycles that had been donated to the agency’s refugee resettlement program. The high schoolers were particularly drawn to the program after learning about Pope Francis’ “Share the Journey” campaign — a two-year initiative that calls for the church to walk in solidarity and support with migrants and refugees. “For most people, a bicycle is something used for leisure or exercise. But for many Catholic Charities clients who cannot afford cars, especially refugees who were forced to leave their home countries and who came here with nothing, a bike is their only means to get to work and other places such as the grocery store,” explained Samantha Astley, volunteer and donation coordinator at Catholic Charities, as she demonstrated how to assemble the bicycles. Students broke into groups and, working together on their hands and knees, meticulously assembled the bicycle parts until they took form. 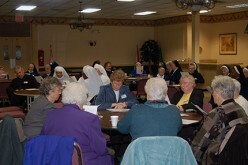 Just two weeks later, another larger group from Gloucester Catholic High School visited Catholic Charities, where they were given a tour of the building, introduced to various staff members, and briefed on programs for veterans, the homeless, the incarcerated, as well as those in need of housing, counseling, financial literacy and substance abuse healing. During their tour, a group of students filed into the ESL (English as a Second Language) classroom, where they were introduced to clients who attend the classes to learn and improve their English. Tarek Mousa, Catholic Charities’ ESL teacher, greeted the high school students and introduced them to his own students — adults who, as refugee clients, receive English and cultural lessons through his courses in order to better assimilate within the United States. Coincidentally, a family from Columbia and another family from Haiti, who recently arrived to the United States through the refugee resettlement program, were attending one of their first classes. Immediately, two young students stepped forward and, to the families’ great delight, were paired up with them to provide one-on-one tutoring. Without hesitation, they sat down and got to work, switching seamlessly between English, French and Spanish with many laughs in between. The rest of the group eagerly engaged in another hands-on activity: sorting through hundreds of bags of donated clothes from parishes across the diocese, fulfilling an important corporal work of mercy during wintertime: to clothe the naked. These clothes were donated to victims of Hurricane Maria who fled Puerto Rico for New Jersey after losing their homes, jobs and — for many — everything they owned. Evacuees who were being settled through Catholic Charities later came in for a clothing giveaway to pick out clothes organized by the students for themselves and their families. The rest of the clothing donations were distributed to other Catholic Charities clients who were in need of warm clothing and accessories. 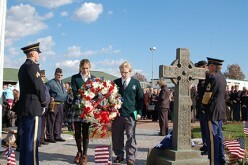 The service given by students from Catholic schools across the diocese is not limited to school hours. In the upcoming months, Bishop Eustace students will be coming into the Camden office every Saturday for four hours to provide free tax filing assistance, as they have done for the past five years. These services are offered for individuals with low household incomes, the elderly, disabled or those with limited English-speaking abilities. “It’s a pleasure to see the eagerness, energy, and skill that these young students bring when they volunteer with Catholic Charities,” explained Michel Acevedo, a Catholic Charities administrator who oversees the training of students and others in this annual activity. For these students from Catholic secondary schools around the diocese, volunteering their time and talent at Catholic Charities is not just about “giving back.” It’s also about “building up” — their community, their church, the world.